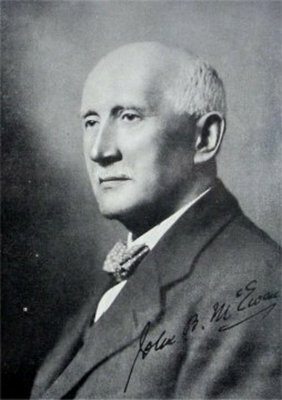 Sir John Blackwood McEwen was born in Hawick in 1868 on the 13th April. He studied first in Glasgow University (gaining an MA in 1888) and then at the Royal Academy of Music in London. In 1895 he was appointed choirmaster of Greenock South Parish Church, and also began teaching at the Athenaeum School of Music in Glasgow. In 1898 he was invited back to the RAM as Professor of Harmony and Composition. He became the Principal of the Royal Academy in 1924 and held the post till 1936. He co-founded the Society of British Composers in 1905, and was knighted in 1931. He was also awarded an Honorary LLD by Glasgow University in 1933. He donated his manuscripts to the University and founded the McEwen Bequest to encourage works from other Scottish composers. He died in London on the 14th June 1948. You are currently browsing the archives for the John Blackwood McEwen category.